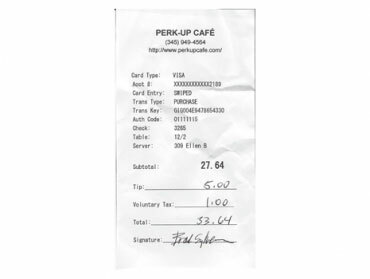 Here we have a standard credit card receipt from a coffee shop. The diner understands that he’s not obligated to order anything that he doesn’t want to receive, but that, for whatever he does order, he must pay the price on the menu. The subtotal is printed in large type on the charge slip. He may then decide whether or not the service he received was of particular value to him. Diners typically choose to pay somewhere between 10% and 20%, depending on the value they feel they’ve received. This is a very special coffee shop. In this shop, the owners and servers pay no involuntary tax and therefore, no tax is passed on to the diner. In this coffee shop, the diner decides what level of tax he feels he should pay his government, in accordance with what he feels his government’s contribution has been to his meal. Of course, as the reader already understands, this is a hypothetical coffee shop. Were its owners to operate in this fashion with regard to the payment of taxes, they’d find themselves in prison for a lot longer than, say, an illegal immigrant who’d murdered someone. But, what if this was the system that we operated in? What if the people of a country had the freedom to decide every day how they felt about their government’s performance and could reward them through voluntary taxation? And so, we might arrive at a tip of 2% to 3%. But there’s another facet to this and it’s an important one. If Government operated on the basis of voluntary taxation, as do coffee shop servers, they’d quickly learn to make sure that, on a daily basis, their most important task would be to assure that their constituents were receiving good service. They’d learn that their primary preoccupation would need to be the well-being of their constituents. The government that performed well would inherently be receiving greater revenue and therefore their own personal income could be higher, but never so high that it cut dangerously into the services that they provided. In addition, as soon as any politician began to demonstrate conspicuous spending on himself (chauffeured limousines, unnecessary travel, income above that of the average person, and any other benefits outside the norm) he’d be likely to be voted out. However, any politician that did an exceptional job of service to the electorate would be likely to get away with voting himself a bit extra. Just like the exceptional waiter, he’d deserve greater remuneration. Of course, this is all wishful thinking. We fully understand that no government is ever going to institute a system in which what they take is relative to what they provide. The world of government is, for all practical purposes, highway robbery without the highway. No government ever truly intends to serve the public. Their task, as they see it, is to extract as much from the public as they can, and still get re-elected. This suggests that victimization by any government is therefore a certainty – that to your government, you are simply a milk cow. However, just as you have the freedom to frequent only those coffee shops where the service is good, you have the freedom to frequent only those countries where you are treated best. Typically, the larger the country, the more rapacious the government and the less the voices of the constituents are of consequence. If the reader feels that this is what he may have settled for, he’d be encouraged to try another coffee shop and see if he likes the service better there.